Himalayan Healing Salt Lamp is the most beneficial, cleanest salt available on this planet. It was formed about 250 million years ago where the energy of the sun has dried up the original, primal sea. This crystal salt is absolutely pristine and natural, identical in composition to the ancient primal ocean. It contains all the elements found in our bodies. The salt lamp is a natural air ionizer that effectively boosts the number of negative ions in the room. It is commonly used in cooking, in place of other table salt, in brine, and for bath products such as bath salts. 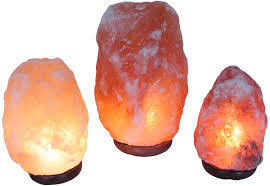 The salt crystal lamp binds the negative ions with the excess positive ions. When the lamp becomes warm, it absorbs moisture and the crystal will be damp on the surface.